The programme consisted of Fauré’s Requiem, Serenade to Music by Vaughan Williams and Blest Pair of Sirens by Parry all accompanied by a thirty-piece orchestra. 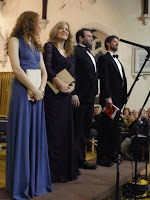 Th soloists were Ellie Partridge (soprano) and Nicholas Merryweather (Baritone). As well as their contributions in the Fauré and Vaughan Williams each performed solos. Ellie sang Le Secret by Fauré and Silent Noon by Vaughan Williams. Nicholas also chose Vaughan Williams singing Love Bade Me Welcome and The Call. All were very musically performed and a delight to listen to. The whole programme was performed beautifully. Several members of the good-sized audience commented on what a lovely programme it was and how beautifully everyone performed. There was well-deserved praise for the Musical Director, Andrew Daldorph, who once again has shown what a high standard can be achieved by a non-audition choir. 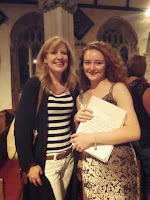 I very much enjoyed the Summer Concert, and the choir were in good form and seemed nicely balanced. Well done to all, and Andrew really made the organ ‘talk’. Quite a number of us in the audience were getting warmed up in the “Amen”, and were hoping that we could have an encore of it so that together we could ‘raise the roof’. (from someone in the audience). Our Summer Charity Concert of Spirituals enticed a good size audience which, together with several individual gifts, has resulted in a total donation of £560 – which will be presented to Tiverton’s ‘Singing To Remember’ group on Monday July 25th. Bridget Tosh was absolutely thrilled at this news and is so very grateful to EDCS for considering them as the local Charity to benefit from our 2016 Summer Concert. As Bridget stated – it is of such great importance to her and her Co-Organiser – Jenny Evans – that other dementia sufferers can be brought along to join in with what is proving to be of such immense help to them and their Carers, in their extremely stressful lives. WHAT CAN I SAY? – To All In Choir – A SUPERB PERFORMANCE with many absolutely stunning moments, both pp and ff – and especially the subtle movement in between those variations. That was what, in this performance, was for me so very, very special. I rehearse all term and well know the ‘dodgy’ passages within each score and the huge effort Andrew has to go to week after week, with extreme patience, repeating the same instructions to us all – BUT – when it came to the moment on Saturday, the way you so intently gave your complete attention to Andrew’s conducting was so obvious – indeed, I found it very, very moving – with the sound you created, definately equal to those feelings ………….. MANY, MANY CONGRATULATIONS to CHOIR & of course, without ANY doubt – to ANDREW. As storm Angus lashed the darkened streets of Tiverton, St Paul’s Church in Tiverton filled with expectant music-lovers anticipating an evening of sacred music with a very operatic flavour. 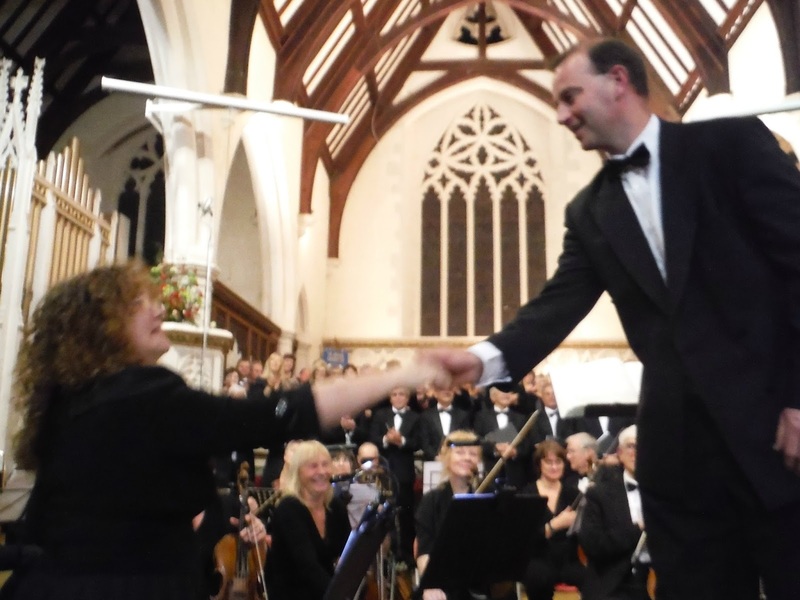 Since the East Devon Choral Society’s triumphant performance of Gabriel Faure’s “Requiem in D Minor” and Hubert Parry’s “Blest Pair of Sirens” in May their Music Director, Andrew Daldorph, has been working with the choir to prepare two more wonderful works. In a change from the usual EDCS venue of Tiverton Baptist Church, the audience were treated to the new look upholstered seating of St Paul’s. The wider sanctuary comfortably accommodated the choir, while the orchestra spread out from the nave into the aisles. Colin Pettit was playing the grand piano instead of the organ, and the orchestra had the muscular addition of John Cullimore’s tuba, last seen at St Paul’s for Andrew Daldorph’s production of Elgar’s “Dream of Gerontius” in 2011. Leading once again, was Fiona McLean-Buechel, with EMG Symphony Orchestra Leader Clare Smith at second desk. 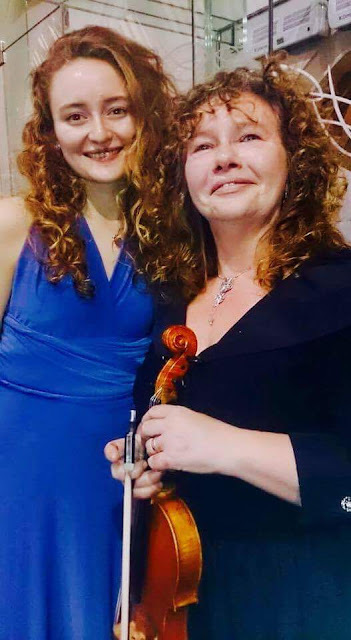 Fiona, among her other commitments, now teaches violin and viola as Lead Tutor for Strings at Trinity Laban Conservatoire in London. Also joining us was former Exeter School student, and now fourth year Trinity Laban undergraduate, Lucy Bray. 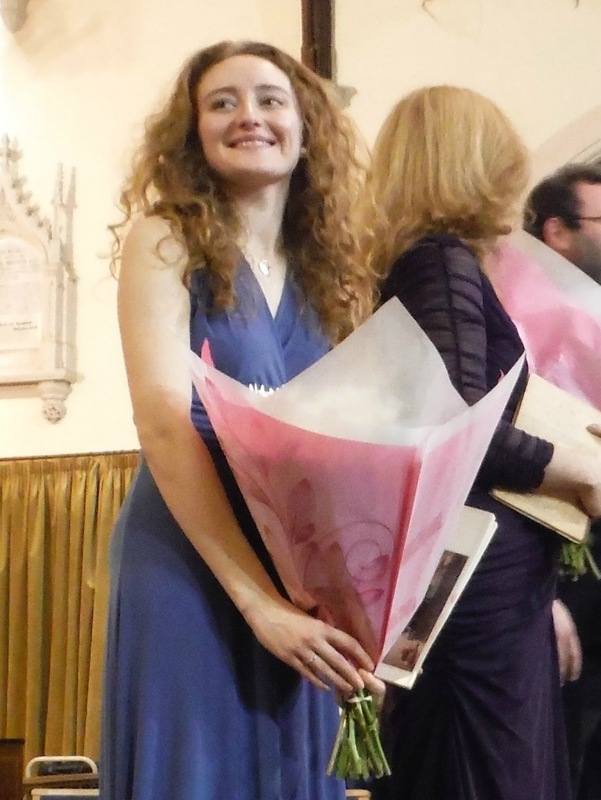 Lucy Bray has also been a Choral Scholar at Buckfast Abbey, and won Penny Adie’s Two Moors Festival ‘Platform Competition’ in the 2012. In 2013 Lucy took time out from her studies to join Andrew Daldorph for a concert of song at the Church of St Cyr & St Julitta in Newton St Cyres. 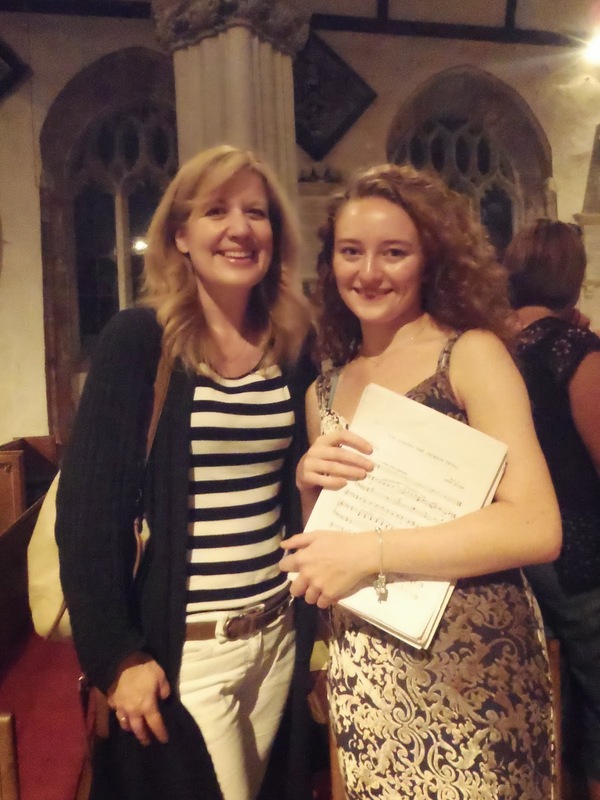 Giving an amazing display of vocal skill in the first half of the concert, Lucy sang in duet during the “Stabat Mater” by Gioachino Rossini, with her former Exeter School vocal coach Alison Kettlewell (herself an amazingly accomplished international opera star). Lucy’s voice was extraordinarily powerful and expressive, with an impressively mature sound. Alison’s mezzosoprano voice complemented Lucy’s with incredible depth and sensitivity. The reunion of teacher and student was a joy to hear. Down the scale, the tenor arias were provided by Royal Northern College graduate and up-and-coming opera star John Pierce. 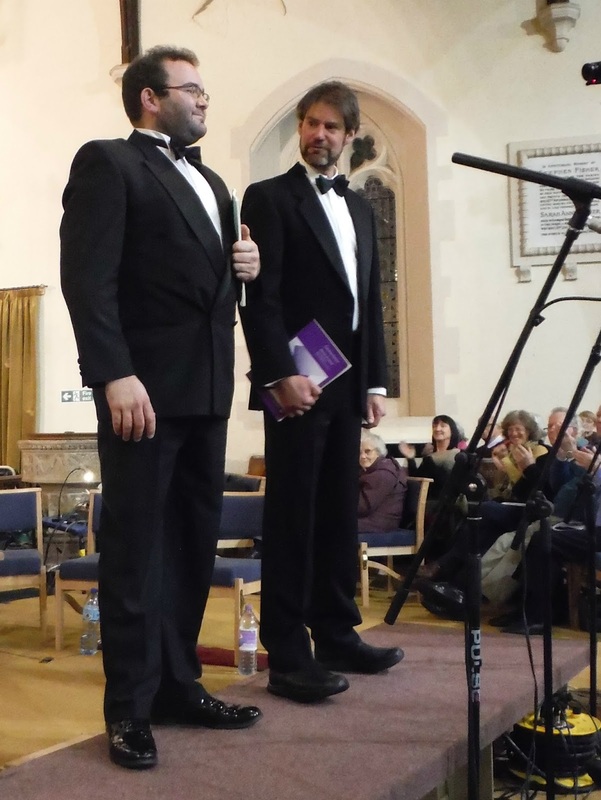 John engaged the audience immediately with his operatic stage presence, and sang with incredible force and passion. Tim Mirfin, now a familiar voice at EDCS concerts, added his redolent bass voice in aria – and highly expressive recitative accompanied by the choir – and the bells of St Peter’s Church striking eight. As Alison and Lucy bowed out, their outstanding work completed for the evening, EDCS Vice-Chair Sue North stepped forward to present them both with well-deserved congratulatory bouquets – allowing the audience to show their appreciation fully for choir and soloists in a protracted round of applause. 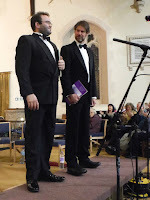 John Pierce and Tim Mirfin returned to the stage in the second half of the concert to accompany the choir in a joyful mass. Puccini’s “Messa di Gloria” opens with a sweetly delicate “Kyrie” for choir, which was beautifully introduced by Fiona’s orchestra. With the soprano and alto voices to the fore, and gentle support fromt the men, the traditional plea for mercy became increasingly impassioned – with the insistent addition of Steve Douglas’ kettle drums, before being led sweetly back to delicate entreaty by Fiona’s string section. Andrew’s preparation had been faultless, and the scene was set perfectly. The almost cinematic “Gloria in Excelsis Deo” was pitched high for the women, creating a false sense of calm – quickly dispelled by the ensuing tumult of voices with powerful support from the orchestra. Each rousing crescendo gave way, surprisingly, to sudden subtle gentleness, which was perfectly controlled by Andrew – and demonstrated the impressive dynamic range of the choir. Half way through the Gloria, John Pierce took over for the traditional expression of gratitude to God for the joys of the world, “Gratius Agimus Tibi”. In a slightly more subdued mode, John was delightfully accompanied by the oboe of Andrew Maries and the clarinet of Chris Gradwell – before the energetic return of the choir. With the barest accompaniment of plucked strings and gentle tympani, the choir continued with a march-like “Qui Tollis” in the distinctive romantic style of Puccini. Trevor Ives’ horns, with the trumpets of Paul Thomas and Claude Lamon, beefed up by John Cullimore’s tuba, added to the impressively regimented sound. Following a climactic, and apparently final, “Amen” the action stopped abruptly. Extensive retuning took place in the orchestra. Fully back in tune, the orchestra were then ready for more. The choir launched into a feverishly energetic “Credo”. 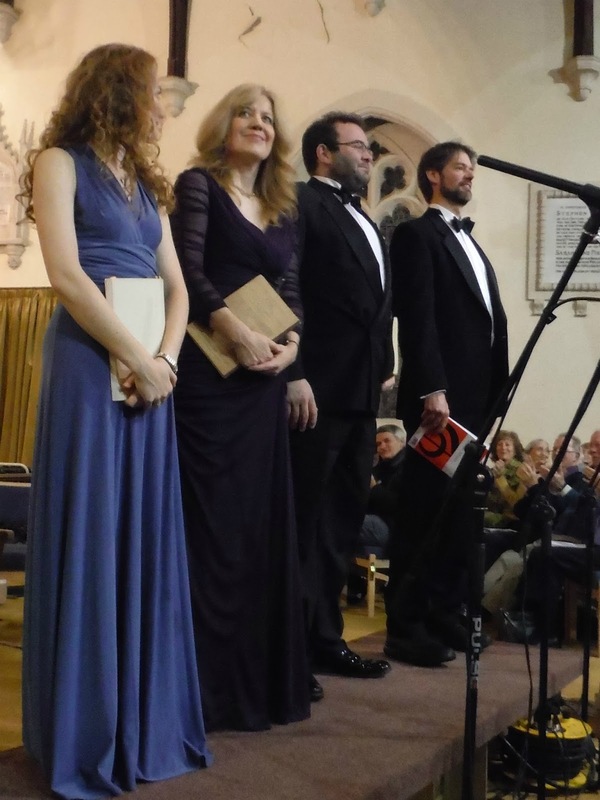 The swooping voices of the sopranos and altos were echoed by the strings – skilfully held under by Fiona and Andrew. Suddenly, the tenor voice of John Pierce joined the choir in a sensitive duet, “Et incarnatus”. Holding back the power, John tenderly accompanied the choir, before giving way to Tim Mirfin’s baritone “Crucifixus”. Tim sang incredibly soulfully, recalling the tragic story of Rossini’s “Stabat Mater” in the first half of the concert. A portentious quickening of the strings indicated the return of the choir. The good news of the “Et resurrexit” started with soft reassurance before expanding outrageously into an overwhelmingly energetic expression of faith. Almost as an aside, the closing words of the creed brought the Nicene theology to a controlled conclusion, but still with some residual power provided by the brass and tympani. The “Sanctus” was much gentler, but still lively, followed by a doleful baritone “Benedictus” from Tim Mirfin, and an energetic “Hosanna in excelsis” from the choir. The “Agnus Dei” brought all the glorious ingredients together finally in an unexpected and extremely satisfying way. John opened very gently, echoed by the choir, before Tim repeated the performance for “Miserere Nobis”. Finally John and Tim sang together in impressive harmony in the reprise, leading to the final soft-landing of “Dona nobis pacem” from the choir. The sudden gentleness of the ending had more impact than all that had gone before, and everything was spectacularly and perfectly controlled. 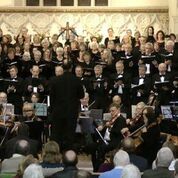 The audience were delighted with the choir’s performance, and the loving work of their Musical Director Andrew Daldorph, with orchestra and soloists who incredibly had only joined them that day. Vice-Chair Sue North was on hand again, with red wine for the men. Just the thing to soothe hard-working vocal cords. Andrew Daldorph, modest as ever, was not expecting any public acclaim, but he was quite rightly presented with a bottle too – to express the gratitude and pleasure, of choir and audience alike, for his magnificent work. 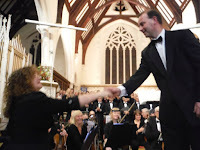 Once again, the East Devon Choral Society have staged a brilliantly chosen, conceived and executed programme of music. The visiting instrumentalists and vocal soloists were exceptional, and the choir, as always, a pleasure to see and hear. Credit must go to Andrew Daldorph for the preparation and execution – and to the EDCS Committee for the tireless work which goes into bringing such splendid music to the public. Not content to rest on their laurels, Andrew Daldorph and the East Devon Choral Society are already planning something even more spectacular for spring 2017. They will be back at the Baptist Church on Saturday 25 March to perform Bach’s “St John Passion”. That will be a concert not to be missed. I can hear that opening chorus already . . .